Whispers in the Loggia: So He Knows Gauntlets, But Where's the Rochet? 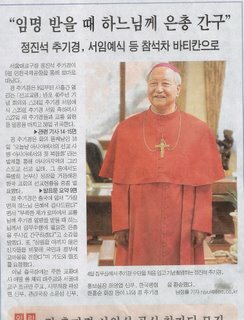 On 22 February, the Korean Bishops Conference stole Benedict XVI's thunder by announcing that Archbishop Nicholas Cheong Jin-Suk of Seoul was to be made a cardinal several hours before the Pope had made his formal statement of intent in Rome. Not to be outdone, Cheong -- shown here this morning in green gloves -- has jumped the gun again by being the first of the cardinals-designate to be elevated next week who's appeared publicly in his new robes. This photo was published recently in a Seoul newspaper, which reported that "On the 4th, in his office, Cardinal Nicholas Cheong (Jin-Sok) put on the Cardinal's cassock for the first time in order to take a commemorative photograph." But where's the rochet? Cross-cord? You know Gammarelli didn't stitch up this one.